“Anybody who snores … go in this room!” The amount of energy the men have at the Room in the Inn interfaith homeless shelter accentuates my lack of any. David and I did 12 miles through some of the most beautiful country this side of Eden today, avoiding any major rainfall, yet I find myself unable to rise to the task of keeping up with the different questions and conversations. People speak freely and invite comment on their lives and my own as if we have known each other for far more than a few hours. It is amazing how community can form amongst people coming out of disparate backgrounds and how it can be a way in which Christian hospitality gets provided for those in desperate need of it. Everyone staying here tonight gets dinner and a clean bed. Breakfast will be served before sack lunches will be handed to everyone on their way out. 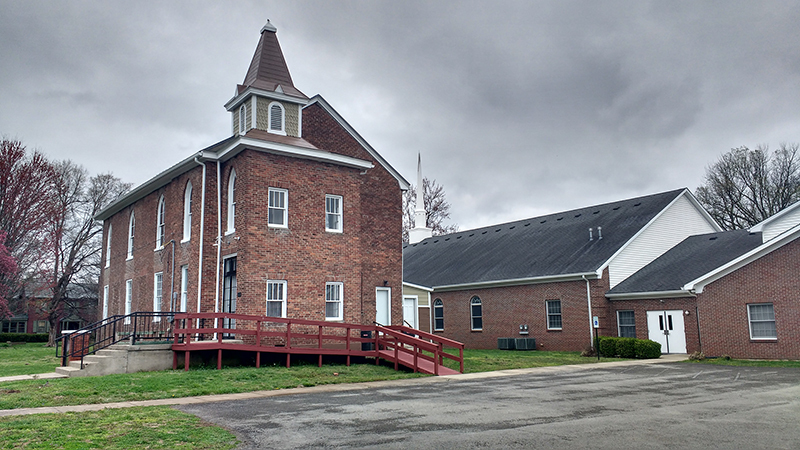 Volunteers from different churches in the Bardstown area started this project in November and have been able to provide spaces for those in need for every night since. It brings to mind Nouwen’s powerful statement: “If there is any concept worth restoring to its original depth and evocative potential it is the concept of hospitality. It is one of the richest biblical terms that can deepen and broaden our insight in our relationships to our fellow human beings.” We have experienced this biblical hospitality throughout our pilgrimage, and it is apparent here in this space. We pray for those who are not staying here tonight voluntarily as we are. Breakfast behind us and only twelve miles to Bardstown, it should be easier to truly focus on prayer instead of covering ground. That said, we have developed a prayer schedule for our pilgrimage. When first beginning to walk, we pray a Psalm and ask for the intercession of any saints or others who we want to be praying for us throughout the day. We also give thanks for the hosts from the night before. We pray the Angelus at the end of the first hour of waking, then a Rosary at the end of the second. The special intention for the morning Rosary is discerning God’s call in our lives. The time between is for personal prayer and reflection broken up by occasional conversation. At some point in the morning, we pray for all those for whom we have promised to do so. A lunch of summer sausage, cheese, and crackers is enjoyed on the roadside before hitting the road once more. We repeat the cycle of Angelus and Rosary and spend more time in personal prayer. 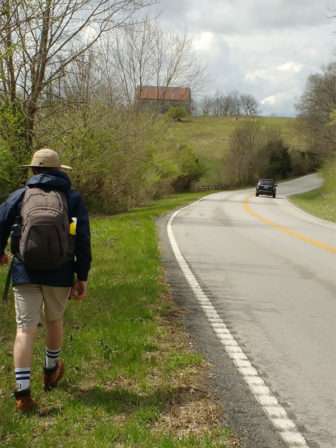 Again, the hope is that the prayer time, especially in the afternoon, will be spent these last two days of walking not just in pleas to God to get us to our destination in one piece, but to allow us to explore our relationships with God and Christ. We thank Dr. Paul Pearson this morning for his help as the Director of the Thomas Merton Center at Bellarmine University. Without him, I would not have read Merton’s wonderful essay on pilgrimage. Thomas Merton wrote: “Man instinctively regards himself as a wanderer and wayfarer, and it is second nature for him to go on pilgrimage in search of a privileged and holy place, a center and source of indefectible life.” There could be no other way to explain why David and I thought it was a good idea to attempt the walk from Lawrenceburg to Bloomfield a day after walking the 24 miles to Lawrenceburg from Lexington. It was not. 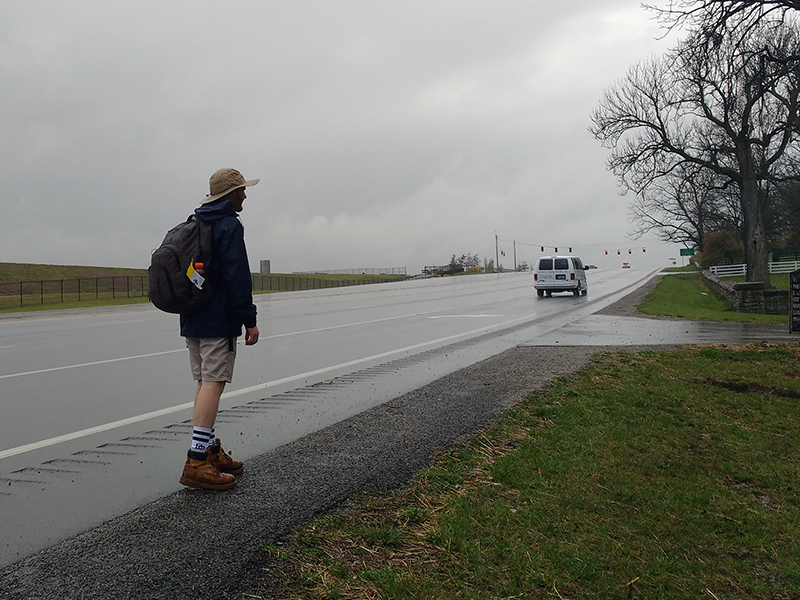 Hobbling into Chaplin, 20 miles down the road, but 5 miles short of our goal, we saw storm clouds on the horizon and spoke honestly with each other. We could not make it. Our failure led us into Whitehouse and Pulliam Insurance to ask to borrow the phone to call our host. The phone was handed over as were snacks, waters, and Bibles and Easter reflections after we explained who we were and what we were doing. Struggling initially to contact our host, the Pulliams immediately offered to give us a ride or put us up for the night. Christian hospitality is an amazing, radical thing. We did end up getting ahold of our host, Mike Simpson, who immediately offered to pick us up. 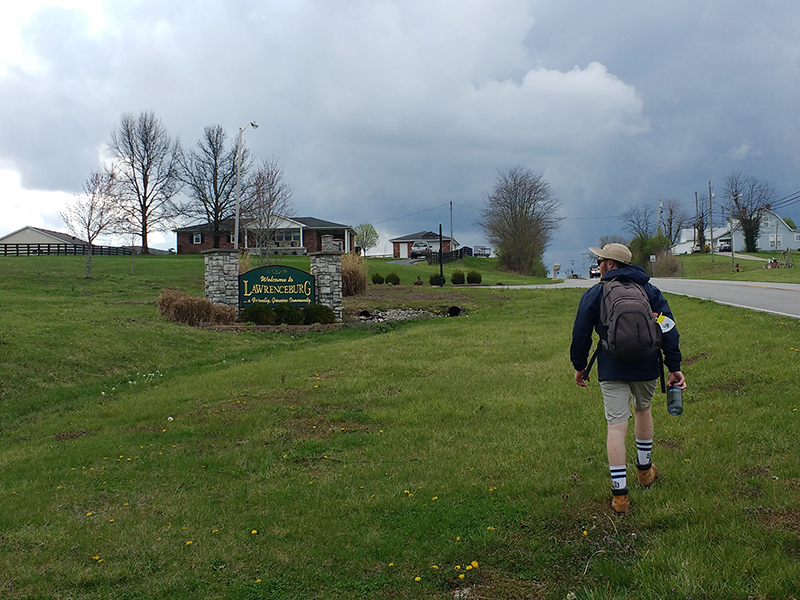 Thus, we avoided a hail storm and were able to enjoy a hot shower, and then a delicious meal during which Mike told us all about the “Holy Land” of Kentucky into which we have walked. So, yes, we failed in walking the whole way as we had planned, but this pilgrimage is about Christian hospitality just as much as it is about the walking. Being received by total strangers with such kindness leads me to venture that we are getting close to that “source of indefectible life” that Merton rightly named as our desire. Tired, sore, and blistered, we go to sleep tonight thankful for Mike Simpson’s willingness to let us cross the threshold into his beautiful Civil War era home; for St. Christopher’s protection these first two days and 50 miles; for the staff of Whitehouse and Pulliam Insurance; and for beds and a roof over our head on a stormy night. As David and I drove around yesterday to get the last minute essentials for the pilgrimage, we agreed that it is folly to look for signs from God in the world around us. Simply, it is too easy to imbue something of little to no consequence with undue meaning. The grilled cheese becomes a conduit of a message from God with its pattern of toasted butter on the bread. The three straight green lights mean it is destined that the best parking spot for the game will be had and that Christ is pleased. Utter folly. Still, when the little sprinkle of rain that marked the crossing of the threshold of the my apartment turned into a downpour during the fourth mile of the day, as we made our way along the shoulder of the highway with cars sailing by, we could not help noticing that a sidewalk appeared and the rain lessened in force just as we began our morning Rosary. 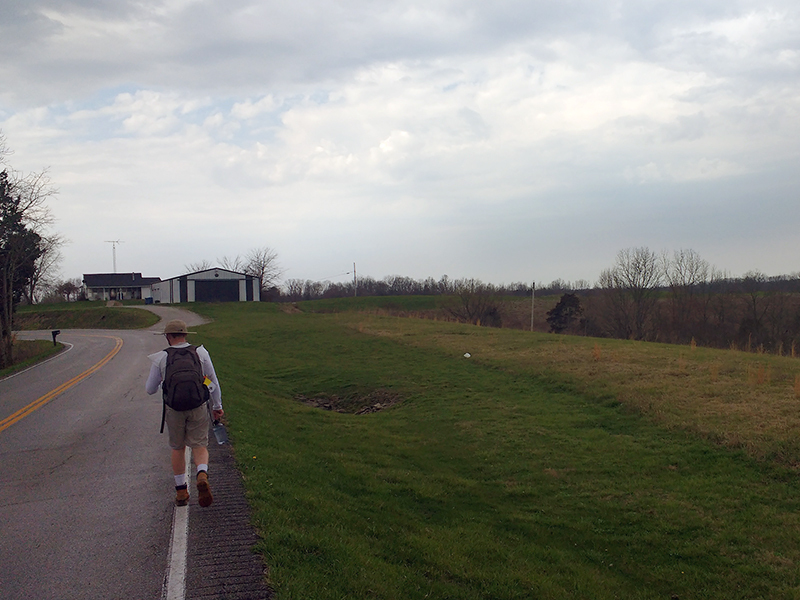 Further, we arrived in Versailles, Kentucky, twelve miles in and our halfway point with the clouds hanging over us, but no serious rain to be found. Within seconds of our sitting down to eat lunch under an overhang, the clouds were rent open and unleashed a vicious rainfall. 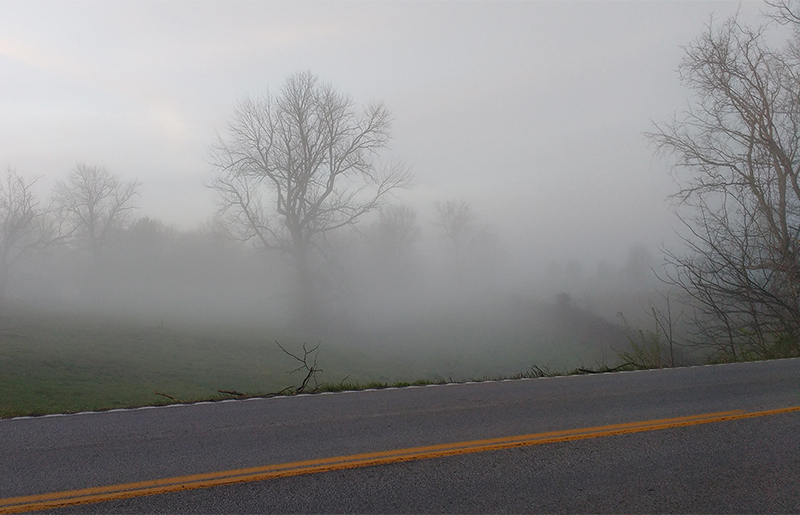 Whether or not either event was a sign, both were welcomed as the miles had piled up throughout the morning. Lunch was a respite from the road, especially once the rain dissipated. Resting before beginning the second half of the day’s walking, we watched the congregation of Versailles United Methodist Church spill out after the morning service. David and I had spent the morning mixing prayer and general conversation. We figured it wouldn’t hurt to say a few prayers in a house of worship. One of the worship leaders grabbed us at the door and introduced himself. We explained what we are doing, and he sought out the pastor. We explained it once more. Nodding along, he was excited to hear of our project, stating that the members of the church were going to do something similar this afternoon. They would be doing a “prayer walk” where they would be praying as they walked through different neighborhoods in town. 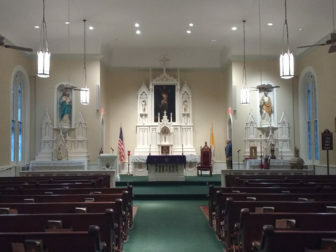 The pastor referred to our pilgrimage as a slightly longer prayer walk. The second half of the day became a limp to the finish line once the miles piled on top of each other. We collapsed onto the front steps of St. Lawrence Church and remained there for the ten minutes before our host family arrived. Now, the Dutch priest Henri Nouwen, a great spiritual writer of the 20th century, writes that is the obligation of all Christians “to offer an open and hospitable space where strangers can cast off their strangeness and become our fellow human beings.” If all the host families in this hospitality network are as open and hospitable as Jeff and Linda Sprague are, then we may never want to stop walking. After much needed showers, we sank into their living room couch to share in the heartbreak of a last second loss for the University of Kentucky in the Elite Eight. The fact that they continued to be warm and welcoming despite the loss should be testament enough to their quality as hosts. Dinner conversation ran from backstories to funny stories to stories about the Catholic Mass and its history. The meal was outstanding. Fatigue and sore legs could be forgotten for awhile. I go to bed tonight having crossed the threshold of a stranger’s home and having cast off my own strangeness within a matter of hours. David and I will be saying many prayers of thanksgiving for a blessed first day of pilgrimage as we tackle our longest day of waking tomorrow. 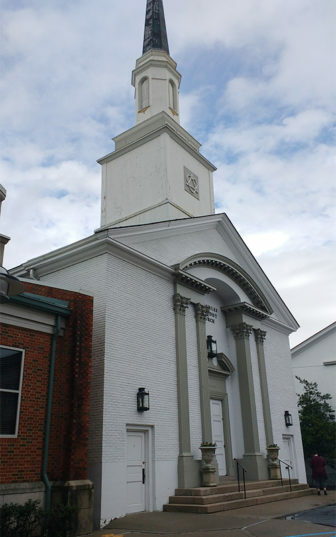 Our thanks to the congregation of Versialles United Methodist Church and to the Spragues. These wise words were spoken to me by Jeff, our host for the night here in Lawrenceburg, as we watched UK fall to UNC and I explained that despite the lack of elevation and easy path, I was still really really tired. He’s right, this has been a long day for Will and I, with rain, tight hamstrings, and a harrowing bridge crossing. Despite all those, it’s been a beautiful day of prayer, reflection, and most of all hospitality. Jeff and Linda have been unbelievably gracious, stuffing us with delicious food and providing warm showers and hot beds. That same theme of hospitality has run throughout the day, as we’ve stopped at people’s houses for water and been greeted with smiles. Best of all was the accidental inter-religious dialogue with the people at Versailles United Methodist Church when we went in to find a restroom but stayed to talk about prayer and pilgrimage, or to use our new friend Pastor Tim’s words, “prayer walks.” Today was a lot of prayer and a lot of walk, and I’m looking forward to more of both tomorrow. I know I’ll need the prayer to get through the 30 mile walk. It can be the limit that must be passed to achieve something greater. Oftentimes that is the way the word is used today; however, just as we return to the original meaning of hospitality in our decision to seek out host families willing to put up strangers for a night, we return to the original meaning of “threshold.” David Cable crossed the threshold into my apartment early this afternoon after making the drive down from Indianapolis. It was easy for him to do so without my even having to invite him to cross it. Such is the way a threshold becomes almost nonexistent between longtime friends and families. Still, many thresholds in the world today can be imposing, or paralyzing, to any person but the recognized friend or family member. I can count the number of actual strangers who have crossed the threshold into my apartment here in Lexington on one hand. I have lived here over eight months. The average comes out to about a single person every two months. For why I struggle to embrace this central tenet of true hospitality, I turn to the lay Catholic theologian Rosemary Haughton who wrote, “Hospitality means a letting go of certainty and control – and paradoxically it’s only this letting go that allows the richness of growth and change that makes real and not pretended continuity possible.” Far more eloquent than I could ever be and far more exact. I want to believe I control my life utterly, and I cannot allow any stranger to prove to me how truly wrong that belief is. David and I set out today to embrace that “letting go of certainty and control,” and we are ever grateful to the host families who have decided they will allow strangers to cross their homes’ thresholds as we make our way toward the Abbey of Gethsemani, famous for being the home of Thomas Merton who championed dialogue with people of all faiths and for making the threshold between despair and faith less imposing. As we begin the pilgrimage outright, I would like to thank both David’s and my families for their never ceasing support of this project. Likewise, I would like to thank the Rodgers family, members of which are sending us off. Thank you also to all the people who have fielded questions and comments, e-mails and phone calls throughout the process of getting this project started, especially Professors Pohl and Thobaben of Asbury Theological Seminary. Finally, David and I thank the Religion News Foundation for its tremendous support.